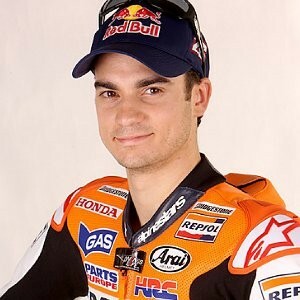 Daniel "Dani" Pedrosa Dani or Pedrosa predictor born on September 29, 1985 in Sabadell, Spain. Men who berpostur 158 cm and body weight of 51 kilograms is the main driver manufacturer Honda are joining HRC Repsol Honda team. Although relatively small stature to the size of the Europeans, Pedrosa had outstanding achievements in the motor racing world. His career in the world of motor racing began when he was only 12 years to win three in Spanish Pocket Bike Championship. A year later, with the maturation of racing skill, he managed to win the Spanish Pocket Bike Championships. Having won the Spanish Pocket Bike, Pedrosa started up in 1999 championship racing higher again, the Movistar Honda Activa Joven Cup. In that year he was ranked 8th by using the RS 125 Honda motorcycle. The following year (2000), he moved to Spanish Championship 125cc championship and won the 4th position with Honda RS 125. Having won the 125cc class throughout Spain, in 2001, Pedrosa started up the motor racing world championship, the MotoGP. Still using the Honda RS 125, the year he only managed to rank-8 in the final championship standings. The next year, still in the 125cc class with Telefonica Movistar Honda team JR, Pedrosa can improve its ranking into the order-3 at the end of the 2002 race season. The new racing season in 2003, still with the same team, Pedrosa managed to poke into the first rank with a total of 223 points. Went on to become world champion in the 125cc class, a stamped capital for Pedrosa to step into a higher class, the 250cc class. In the first year of its debut in the 250 cc class, with Telefonica Movistar Honda team of 250, he immediately became world champion in the 250cc Grand Prix. One year later (2005), he again dominated the race and maintain the 250cc GP world title. At the 2006 racing season, Pedrosa began to appear in the premier class (MotoGP). Honda is still using, he joined with the Repsol Honda HRC. This team is a great team that has brought Michael Doohan won the world title five consecutive times (1994, 1995, 1996, 1997, 1998), Alex Criville became world champion in 1999, and became world champion Valentino Rossi in 2002 and 2003. The first year featured on this achievement Pedrosa MotoGP class has not been much. Apart from having to adapt to his new vehicle, he also got a tight competition from senior riders are poor across the first MotoGP race. Nevertheless, he had won the third race of the season that year (2006). For the record, in 2006 this became the world champion team-mate Pedrosa, Nicky Hayden is. In the season of 2007, along with the change in regulation from 1000cc to 800cc, Pedrosa a small berpostur is designated as the primary driver manufacturer Honda. It is time to make some of the Honda riders, especially when it's defending champion Nicky Hayden, assume that Honda deliberately creating a special mount for Pedrosa. However, apart from the skewed assumption, Pedrosa was able to show his achievements by being runner up in the racing season in 2007, under Casey Stoner.